March is National Nutrition Month! What a great opportunity to remind your clients of the health and nutrition lessons that are closest to your heart! To make your life a little easier, I did a great big round up of helpful links for Nutrition Month. I hope you enjoy them! I've whipped up a bunch of Nutrition Month materials and set them up in the store -- which ones will make your life easier? 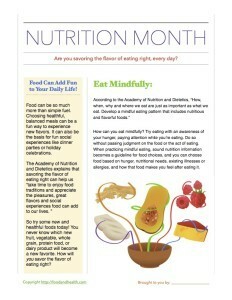 Oh and in case you missed it, I also made a Nutrition Month handout that comes free with the Nutrition Education Catalog. Get your copy today! Here are a few more of my favorite nutrition education materials, fresh from the Nutrition Education Store!